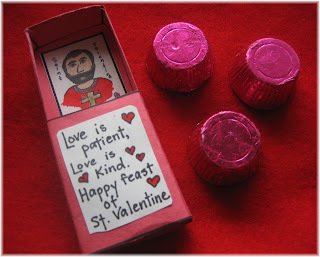 This little matchbox may be tiny but it holds a little Saint Valentine picture and a mini peanut butter cup, two sweet things that go great together. 3.) Print out my Saint Valentine picture. Color it, cut out the square and paste it to the inside of your box. 4.) Put a peanut butter cup into the inside box then slide it into the outer cover. 5.) Say a happy little prayer for the person who will receive your little gift ... and then give it to them. This is too cute ♥ Love the new banner, Vee! That is so clever! I love it!! I love your Paper Dali illustrations! 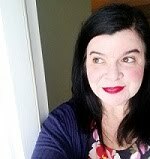 I blogged about your St Valentine and Our Lady of Guadalupe prints on my site. Would it be possible to include more than one Saint Valentine picture on the same sheet? I'd like to maximize the use of one sheet of printed paper so I can make more than one matchbox.